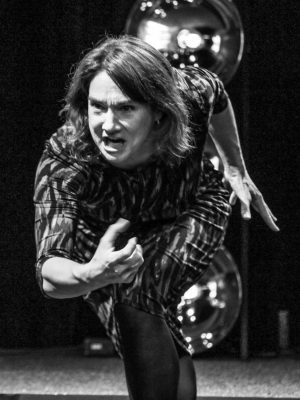 Emotionally on stage through a touching performance, mentally, through coaching with dialogue that resonates and finally I move them physically by connecting their bodies and breath. I am a Performance Artist which means developing skills to play and create new relationships, to cross borders (political and emotional) to grow through studying life from different perspectives and to explore being yourself and another at the same time. And I am committed to supporting others to do this too, in different environments other than the stage. In the corporate business world, I connect bodies and breath, I connect intentions to voice and movement, and help turn values into actions for Individuals and Teams. I have 40 years experience teaching, performing and producing on and off stage. I was astonished to hear Sandra and Robert defending my value as an artist. No one had done that for me before. I don’t know the ‘codes’ for translating what I do into return on investment for the corporate world and a creative can’t always be visible and logical. They represented my skills, perspective and process and then gave me the space and trust to do my job. They are a clear bridge between corporate and creative, making thorough explorations and interviews with both artist and client to make sure there is a match on every level.